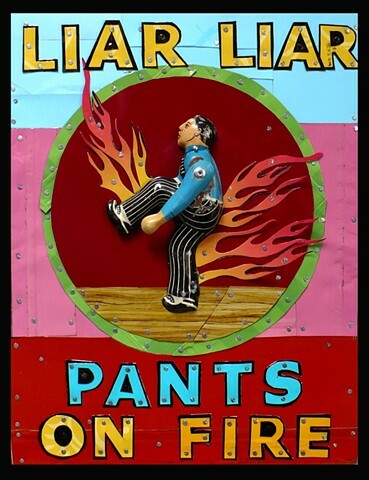 Liar, Liar is about a lie I told and kept as a secret for 6 months or so. It was fun to make this piece because I think some people I know may have thought it was about themselves. The original piece was purchased by a woman for her husband as a 10 year anniversary present. She told me he has a good sense of humor. An image of this piece was chosen by the Seattle Office of Arts and Cultural Affairs to be made into a large poster and grace the side of a construction site wall in down town Seattle. An addition poster will be framed and become part of their permanent collection.